The final clue for poster six is published, stay tuned to Twitter for the reveal. I just checked one more time before going to bed, and look what happens. 8pm in Dallas would be 2am here, so I might not be around for this one ! That would be 9pm for me. What is PST time for 8pm Dallas time? Zort...you were born to do this! You're so on top of everything! I think it should be 6pm PST. Thanks, Sayid'sgirl! I gather info will be posted on Twitter? Anybody actually going? I don't know if anyone here is going or not. There were a couple of people at Dark's who said a few days ago they were going and gave out their twiiter pages. I should have said you're welcome maven. That'll be about 9pm here! Not bad. No problem, Sayid'sgirl. I know this is the place to get answers and help! The Hostile Witness at Dark's forum has already checked out the area! Didn't post a twitter acct. yet. I was going to go, but I am not going anymore because we have to get into the venue for the clue. Sorry everyone. I think they'll probably be giving out the URL via twitter at the same time as they give it out at the concert. I'm not sure if they'll give it out at the concert or not. Maybe they will. I think it's just going to be a twitter update. But I could be wrong. I may go or at least will be sending 1-2 proxies in my place. I will be twiter covering it via live or remote. How do you know if your print has shipped? Still waiting on my "Crash." I'm guessing the poster will be Charlie centric! The twitter account if pacesoilchange with a pic of the Drive Shaft ring. Hi all. Great news! Twitter! That's easy enough. I think that FOB maybe up for a little "You All Everybody" and that would certainly be worth seeing. 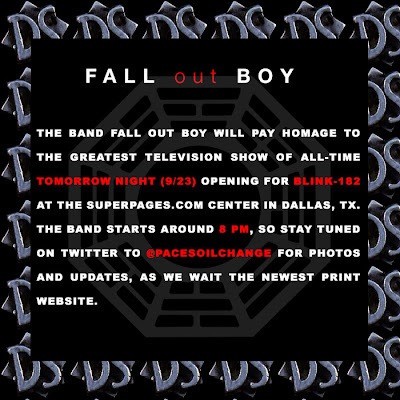 Some of the Tour has had live coverage or at least video posts at the blog site for FOB. I'll see what links I can track down. Charlie. Definitely, a water-cooler moment. notpennysboat.com my guess. DraftShaft poster? 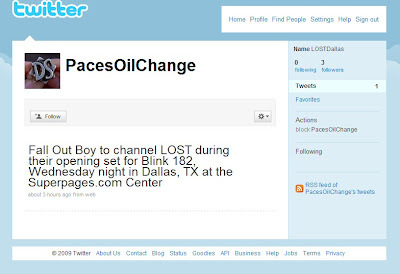 The FOB fans were asked to join the @PacesOilChange and I see a lot of them there already. Will there be two poster url links? See everyone here and on the Twitter feed tomorrow night. Should be a fun evening tomorrow! WOW That's pretty funny. I'm slightly dyslexic and have hard time proof reading what I write and writing what I mean. I think I leave it for others to ponder. PacesOilChange 393 followers thus far. I'm in a meeting all morning and really hope I don't miss anything. I get so excited on these days. Wow 508 followers! The last time I looked i was 70. And none of them seemed to be LOST fans. At least I'd didn't recognize any of the names. I'm hoping for a quiet day ARG wise as work is hectic today. Chester - that's one hoopy name. For anyone like myself who didn't stay up til midnight to signup for LU. Here's a youtube of when the countdown clock flipped to zero. @Sayid's girl: Thanks for the link! Really great easter egg, if you can call it that. And I thought I was going to be Rick Rolled. This is just conjecture, but I'm guessing the poster tonight might be by Jay Ryan. He's an artist from the Chicago area (like Fall Out Boy), and he's well known for his concert posters. Maybe a fake DriveShaft concert poster? Just a lot of coincidental stuff (and hopeful wishing), but it makes sense to me. I've really been holding out for Ben or Desmond, but a fake DriveShaft concert poster might do me in. Thanks for that link Waffle! Re posted due to typo. ahhh! Things should be hopping later today! Great link, Sayid'sgirl! Attention to detail is everything. Thanks for the heads up on TPTB's forum posts! That's fan appreciation for sure! Can someone please tell me what 8PM Dallas Time is converted to basic GMT. I really lost track while tryin to calcualte it myself. 3am? 4am? Oh, hm.... I don't know the difference between GMT and GMT + BST. Masheen, are you in the same time zone as London? If so, then you're 6 hours ahead of Dallas. I hope it's another Jack and Kate poster.
. . . found a live link to concert, but it requires you to buy chip bag and wave it in front of camera? I love coming here. (Wish everyone didn't hate Jack and Kate. They don't even have a poster). This time zone thing is driving me batty. I live in Utah, yet I don't know what the time zone difference is between Dallas and here. I feel like this shouldn't be so hard for me. But sadly I struggle with it. I would love a Charlie related poster. Though based on how many followers the twitter is at, I feel like it's going to be a race. (Assuming it's a good poster). Sorry for long reply. This anticipation is exciting and very nerve racking. Jack and Kate are featured prominently in two posters. The LU T shirts are now on sale. I think Dallas is one hour ahead of you. I apologize for my comments. As a J/K fan I think I'm too quick to defend. (Though I like to pretend that 'triangle poster' was not featuring either. Kidding of course). Ah, you are right. I feel even more foolish for not being able to figure that out. Thank you. No prob, MeSoCrazy. I'm just anxious for some Others posters!!! Sayid'sgirl: Thanks for the head's up on the LU tees. I ordered mine! So proud to be in the Freshman class of 2010! You all ready for TONIGHT??? NEW POST for tonights activities.